Over the last months, everything we thought we knew about Hans Winterberg has been turned on its head. The posting I made some two years ago resulted in enormous interest and re-opened an iniquitous chapter, in which music smashed headlong into post-war politics. The blog posting resulted in journalists contacting me, in musicians asking for scores and even a festival around Hans Winterberg held in Tucson Arizona. Recordings are being made and the story of the German Jewish Czech composer who was kept on in the same Nazi concentration camp by the post-war Czech government both intrigued and enraged readers. The contract, signed in 2002, also specifically instructed the SMI to deny the existence of any Winterberg family members. To Kreitmeir, this was the limit. His mother Ruth, Winterberg’s daughter was 11 years old when her parents were forced to divorce by Nazi race laws and her father deported to Theresienstadt. Ruth was subsequently placed in a children’s home. Years later, having made the arduous journey out of Prague to Germany, she married Peter Kreitmeir’s father, gave birth to Peter and abandoned both husband and child four months later. She was severely damaged as an individual and Peter did not meet her until a few months before her death in December 2015. 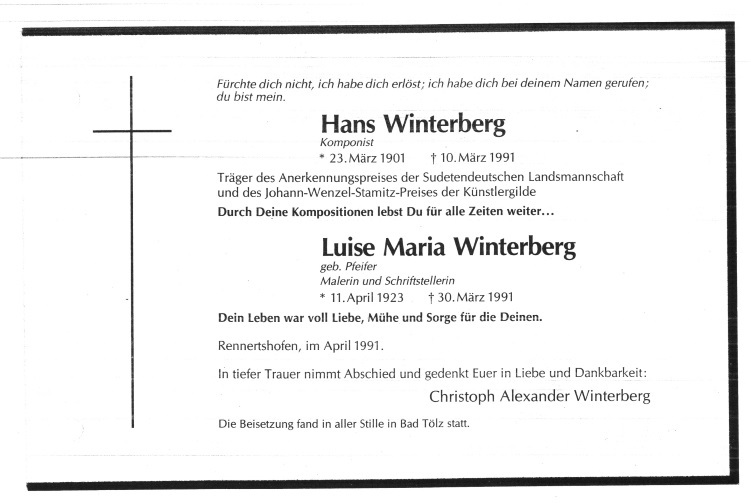 It was important to Winterberg’s fourth wife and adopted son Christoph, for reasons that might become apparent, that the existence of blood relatives be denied. When Peter showed up, Christoph willingly handed over power of attorney, supported the annulment of the SMI contract and let Peter Kreitmeir take control of the Winterberg estate. Everything seemed in place for the world to discover the music of Hans Winterberg. The response was universally positive, and not just because of the intriguing story. The music was engaging, gripping and strong by any measure. It was music flavoured with Czech rhythms and the jagged melodies that characterised Czech composers from Janáček to Martinů, Hans Krasa and Pavel Haas. It was the rhythm of spoken Czech, as Janáček explained, and created a sense of forward momentum, reflecting the second syllable accents that characterise the language. Hearing music with obvious Czech accents by the German composers of Prague and Brno such as Pavel Haas, Hans Krasa or Erwin Schulhoff stood in stark contrast to contemporary German and Austrian composers in Berlin and Vienna. Winterberg appeared to be the missing element from this group of Czech composers, and the obvious reason he was missing was because he wasn’t murdered in a Nazi death camp. He was overlooked in the frenzy of performing works by murdered composers. Survivors such as Hans Winterberg or Szymon Laks had to wait to be discovered. With Laks it was easier: there was no embargo placed on his estate. The true story of Hans Winterberg, however, is murkier, more complex and leaves open questions of identity and fundamental existential survival. Just as concentration camp survivors hated recalling the ethical dilemmas they addressed in order to live, so the true Winterberg story also confronts us with ethical cul-de-sacs. This is what we know: The Potsdam Conference and the resultant Beneš Decree ethnically cleansed all traces of German from Czech culture by expelling all Czech Germans. Indeed, it was not just Czech culture that was ethnically cleansed. 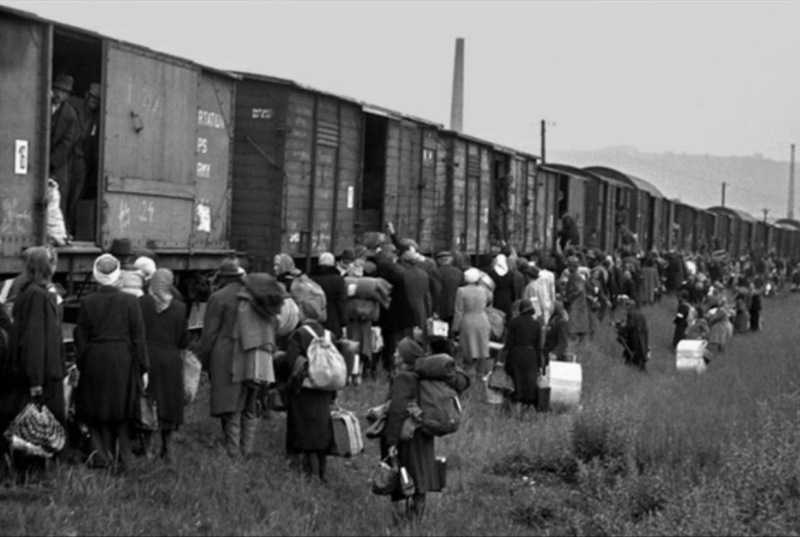 Twelve million German Poles, Czechs and other Eastern Europeans were made to leave their homes and forced to relocate to either Germany or Austria. Some walked while others were herded into cattle cars. 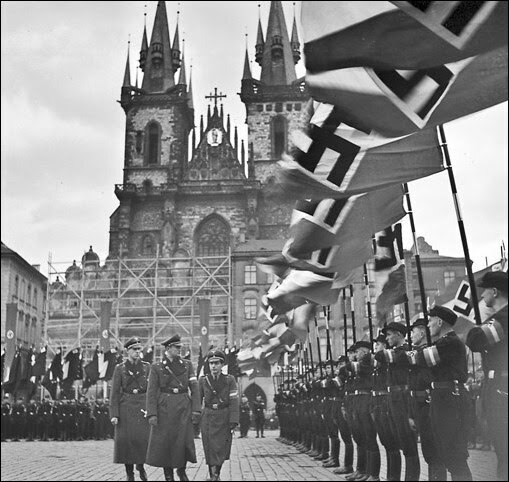 Neither pre- nor post-war Germany was a country many Czech Germans were prepared to recognise as a homeland. The story of Eastern Europe’s ethnic cleansing of Germans post 1945 is a cruel and sobering chapter hidden by the shadow of Nazi brutality. Hans Winterberg was seen as a victim of anti-German savagery. He became a symbol of historic injustice and relativized the role of Germans as sole aggressors. What the Nazis attempted against the Slavs, the Slavs repaid innocent Germans tenfold. According to the SMI, contemporary German historians and even close contacts of Winterberg himself, he had not been freed from Theresienstadt with the defeat of Nazis in Czechoslovakia, but moved from the camp to its actual prison to await deportation to Germany. We were informed he remained there for another two years. Except we now know that Winterberg’s part in this story wasn’t true. The truth is actually far more revealing of the Germany immediately after the war, and incredibly, of Germany today: HansWinterberg was initially hijacked by a community of post-war refugees, who claimed him as one of their own. More recently, he was commandeered by contemporary German musicology. Both groups set great store in Winterberg being a victimised German Czech composer. Winterberg soon realised upon arriving in Germany, and following the Communist Coup of 1948 in Czechoslovakia, this was a useful if not entirely accurate identity to take on. He played along. Louise, his fourth wife, had endured the death-march from her home in the Sudetenland to Bavaria while carrying the child of a German soldier. She could never forget or forgive. Winterberg through various twists of fate became part of the community of expelled German Czechs living in Bavaria. It was where his first wife, Maria Maschat, and daughter had ended up, both of whom were German Czechs and deported under the Beneš Decree. Maschat was a former child prodigy, accomplished pianist and promising composer in her own right. 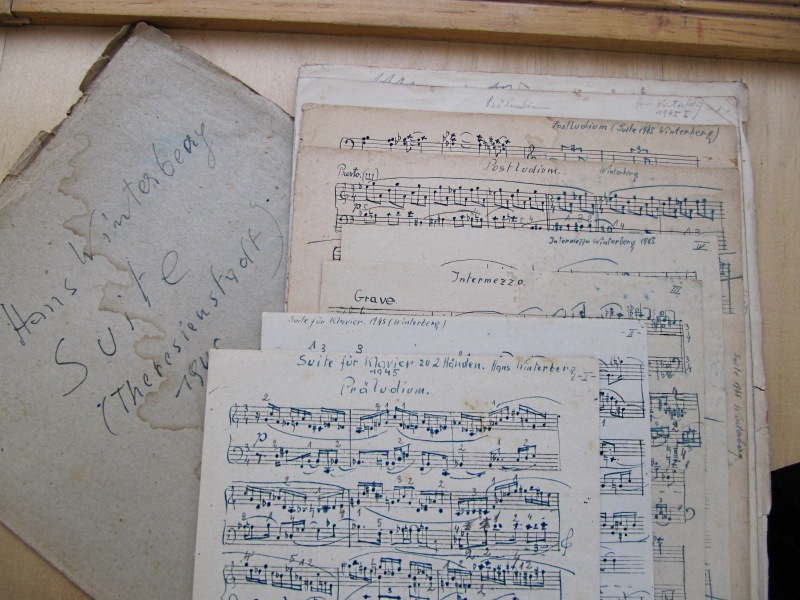 She had taken Winterberg’s scores into safe keeping when he was deported to Theresienstadt. Maria Maschat wasn’t Sudeten German, but part of Prague’s historic German Czech community. Winterberg’s family were Prague Jews and could be traced back 300 years or more. His father had partially owned a factory in the Sudetenland province of Czechoslovakia, but the Winterbergs themselves were not from the Sudetenland. To Slavic Czechs, the Sudeten Germans, from their province in the North-western end of the country, had facilitated Hitler’s absorption of Moravia and Bohemia. They became Nazi colonies, while Slovakia was unbolted from the Czech regions and returned to its pre-1918 status as part of Hungary under the puppet regime of Miklós Horthy. Little wonder that Czechs hated their German speaking neighbours. The fact that German Czechs, whether Jews or non-Jews, were frequently as anti-Nazi as Slavic Czechs was of little significance. It was collective guilt and collectively, all German Czechs would have to resettle outside of the now 100% Slavic Czechoslovakia. Following the death of Winterberg and his fourth wife, his adopted son sold the musical estate to the Sudeten German Music Institute in Regensburg in 2002. 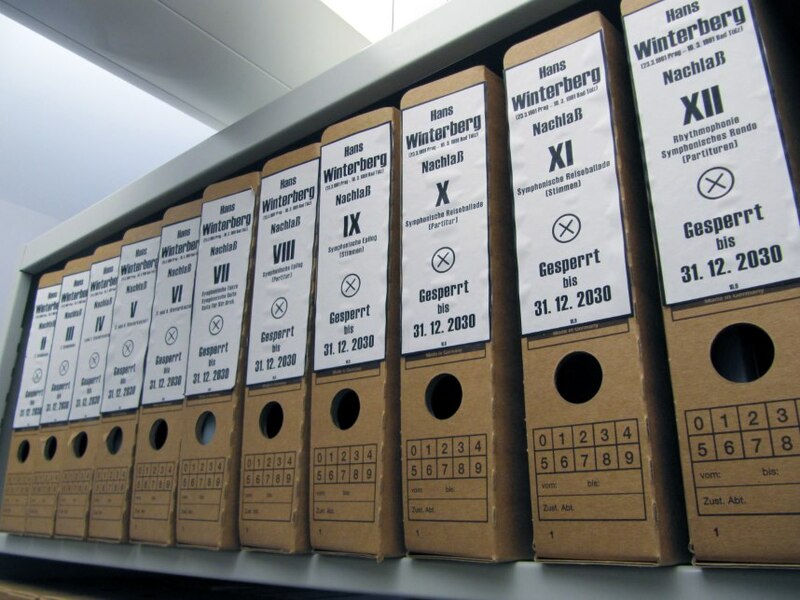 The contract states that Winterberg’s works are embargoed until January 2031. Following the lifting of the embargo, no mention was ever to be made of Winterberg being Jewish, a condition meant to hold into perpetuity. Performances of his music could only take place if Winterberg was specifically billed as a “Sudeten German composer”. For those unable to read the German, the following was agreed between the SMI and Christoph Winterberg: the SMI is not allowed to acknowledge the existence of the Hans Winterberg estate, let alone its housing with the SMI. There is to be no index of works or any index of the estate in its entirety. The fact that the estate was in the possession of the SMI was not to be made known until January 1st 2031. Any and all inquiries regarding living relatives were to be – “without exception” – answered “in the negative”. But following the lifting of the embargo, questions started to be asked. Today’s Sudeten German Music Institute, under younger and more enlightened management, chooses not to differentiate between ethno-musicology and serious or popular music composition. This is a fine principal, but in practice, the Institute is founded on the musical heritage of the German Czechs from the Sudetenland and their largely folk traditions. Winterberg was not a Sudeten German. The Sudetenland had turned itself into a German speaking province in Northern Czechoslovakia in 1919 and even if most German speaking Czechs did not come from within the physical borders of the Sudetenland, the Sudeten German Music Institute in Regensburg effectively annexed all German speaking Czech musicians as “Sudeten Germans”. A brief explanation of the co-existance of Germans and Slavs in Bohemia and Moravia is needed to understand why such tensions existed. Slavic Czechs had suffered at the chauvinistic hands of German Czechs throughout the 19th century. From 1918 until 1938, they attempted an awkward co-existence. With the Munich Accord in 1938, Slavic Czechs felt betrayed by their German-speaking fellow citizens. In truth, however, many Slavic-Czechs, in both local and central government, had attempted to enact restrictions on German-Czechs, making the Sudeten plea for “rescue” by Hitler all the more plausible. The coexistence since 1918 was not happy and after the bloodshed ended in 1945, the leaders at the Potsdam Conference looked away as more bloodshed ensued. Churchill, Truman and Stalin had decided tidying up the continent was best carried out with Europe’s German speakers kept firmly west of the Oder and Neiße Rivers and out of Czechoslovakia altogether. It was a practical, if messy solution. This grouping together of all Czech Germans as “Sudeten” was not something Czech German Jews would have welcomed. They freely expressed their Czech identity and certainly Winterberg’s music was extremely Czech sounding with no obvious relationship with the music of inter-war Austria and Germany. Peter Kreitmeir was unhappy with his Jewish grandfather being housed in an archive that had taken him on the basis of denying his Jewishness, while placing a lengthy embargo on his music. Even if you were prepared to expand the definition of “Sudeten German” to cover all German speaking Czechs, he was unhappy with the arrangement and began to dig. Tirelessly, Kreitmeir wrote various Czech departments and archives and eventually the true Winterberg story began to unfold. The assumption was that Winterberg had put himself forward as culturally German in the 1930 census. According to German historians, this bit of innocent box-ticking in a national census trying to determine the cultural mix of the newly founded country of Czechoslovakia would lead to his incarceration in Theresienstadt until 1947 and eventual expulsion. Yet Kreitmeir had always wondered why works written by his grandfather between 1945 and 1947 were dated with “Prague” and not “Theresienstadt” or “Terezín” as was the case with the works he composed following his deportation to Theresienstatdt in early 1945. 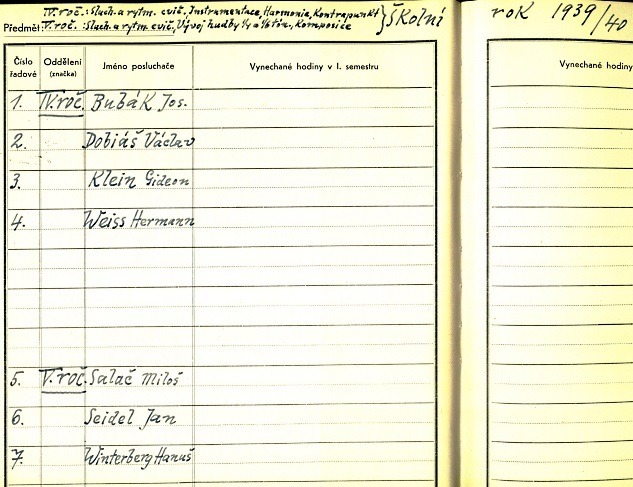 The answer arrived from the Czech National Archives with a copy of the Winterberg census form from 1930 which clearly shows that Winterberg was not identified as German, but Czech. As such, his imprisonment in Theresienstadt was only a few months and with the liberation of Czechoslovakia, he was free to return to Prague in May 1945. The imprisonment until his “deportation” In 1947 was made up: but by whom, and for what purpose? This is where politics, survival and human nature start to make facts go murky. 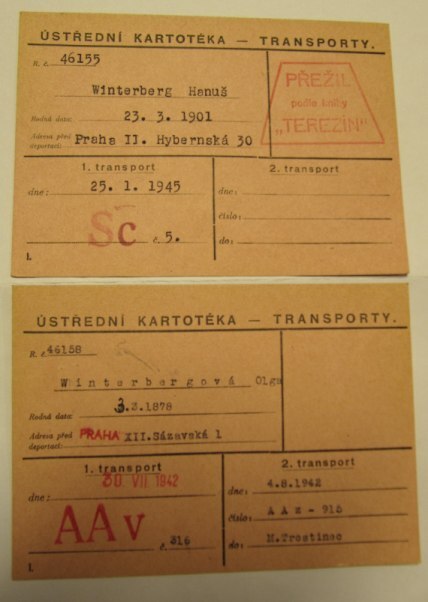 Hanuš Winterberg (as he was known in Czech) applied for a passport in 1946 in order to travel to Germany to retrieve the manuscripts he had given to Maria Maschat for safe keeping. The request was approved and in 1947, Winterberg arrived in Bavaria where his former wife was working at Bavarian Radio. The marriage was no longer retrievable: the enforced divorce, deportation of Winterberg to Theresienstadt followed by the expulsion of Maria Maschat and daughter Ruth had made a return to former normality impossible. Winterberg would embark on a series of marriages to much younger women, mostly music students. The Coup of 1948 meant Czechoslovakia was now firmly under Communist control and anchored in the authoritarian Soviet Bloc. With a young and pretty German girlfriend, soon to become wife number two, he would have had little incentive to return; yet remaining was also not without problems. His biography is as follows: born in 1901 in Prague to Rudolf and Olga Winterberg. By the age of nine, he was already studying piano with Therèse Wallerstein, and at Prague’s Music Academy, he studied conducting with Alexander Zemlinsky and Fidelio Finke and composition with Alois Hába; one of his fellow conservatory students at the time was Gideon Klein. In the German Theatre Yearbook of 1929, he’s listed as a rehearsal pianist at the opera in Brno, though he was apparently not exclusively bound to the house and worked with a number of ensembles. He married the Roman Catholic Maria Maschat in 1930 and their daughter Ruth was born in Prague in 1935. Only months following the annexation of the Sudetenland in 1938, the rest of Czechoslovakia was classified by Nazi Germany as the ‘Protectorate of Bohemia and Moravia’. Despite the misleading language, by 1939 it was essentially an annexation of most of Czechoslovakia. The country was one of the new ‘concepts’ set up following the end of the First World War and had only been in existence for twenty years. Broken down into its constituent states of Bohemia and Moravia, it was folded into the ever expanding Nazi empire. Slovakia, as stated above, was partially returned to Nazi compliant Hungary, from where it had been removed by the allies in 1918. It left Winterberg highly exposed. As a Jew, Hitler’s government would not have allowed him automatic German citizenship, though his marriage to a non-Jew accorded him a so-called privileged status. How “privileged” this status was, is highly debateable, as the journals of Victor Klemperer confirm. The composer Edmund Eysler was also accorded a “privileged” status, and like Klemperer, dreaded leaving the house for fear of being arrested during recurrent Nazi round-ups. Any Jew found on the streets was arrested and deported. Afterwards, even “privileged” Jews were lost as their marriages were declared void. With their divorce in 1944 as directed by Nazi laws on “inter-racial marriage”, Winterberg was instantly arrested and sent to Theresienstadt, where his mother Olga had earlier been deported before her murder in Maly Trostinez. Winterberg was a Czech with a Prague pedigree reaching back more than 300 years. Saying he was “Czech” on the census was self-evident. Having attended only German schools meant he was completely bilingual, though probably more literate or at least more at ease with German, as was the case with most Czech Jews. German was a language, not a nationality during the census of 1930, and the question that was asked was one of cultural identity, not of language. It might be similar to a citizen of Suisse Romande expressing a Swiss cultural identity with French as their principal language. With arrival in Germany, a new girlfriend, an unwelcome political development in Czechoslovakia and a network of other Czechs now living in Bavaria along with his ex-wife and daughter, the best course of action for Winterberg was to fit in. 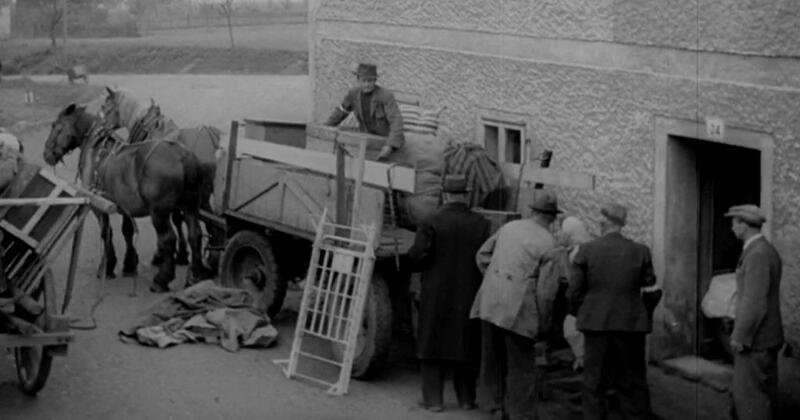 He folded himself in with the community of fellow Czech refugees and “victims” of the fateful 1930 census. The bitter irony was that he had now become part of the very community of Sudeten Germans who had called upon Hitler to save them from the Czech government in Prague. These Sudeten Germans were the very people who had “aryanised” the Winterberg family factory. It must have presented Winterberg with an ethical dilemma, though merely finding a way to survive was all the ethical judgement required for someone who had come out of a concentration camp alive. 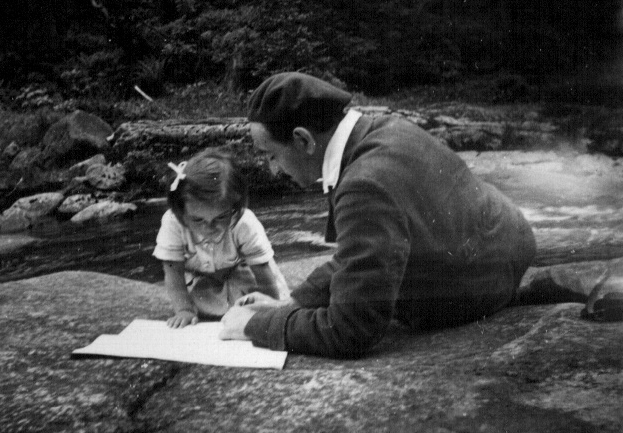 How he chose to survive can be deduced in an internal memorandum written in 1952, by a Bavarian official in which he explains that Winterberg was a “Census refugee”, doubly punished for being a Jew as well as a Czech German. It was the myth that survived, and indeed, the myth that kept him in Germany. The strong implication is that Winterberg was only willing to play the Sudeten German to a limited extent. He was clearly not willing to throw his entire lot in with Simbriger’s hapless exiles. Yet even in a letter from Winterberg to Simbriger, in which Simbriger attempts to nail Winterberg’s true national colours, Winterberg skates about judiciously. 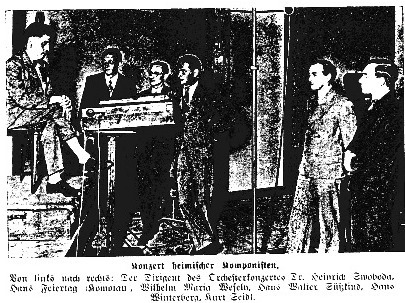 Instead of offering a direct answer, he squirms and explains that it was his father who filled in the census form in 1930; and rather than answering Simbriger’s suspicions, he replies with what he hopes will be accepted as rhetorical questions: “Didn’t you know that Alois Hába preferred to speak to me in German because my Czech was inadequate?” (Hába was an unapologetic Czech nationalist, as Ernst Krenek tells us in his memoirs) “Didn’t I only attend German speaking schools?” “Should I be held responsible for how my father filled in the census form?” “Have you ever heard me speak Czech?” and so on. A more incriminating question would have been why Winterberg didn’t set German texts to music other than Franz Werfel and, following the war texts by his fourth wife Louise. Yet Winterberg didn’t set Czech texts after 1945 either. The question hangs in the air: was it because Winterberg could not bring himself to deal intimately with the German language in music, or was he perhaps afraid that by setting music to texts in Czech, he would be flushed out. Who knows – we can only speculate. Winterberg landed initially in Riederau am Ammersee before relocating to Munich where he became a writer and editor for Bayrischer Rundfunk and a teacher at the Richard Strauss Conservatory. He married his much younger student Heidi Ehrengut , an apparently passionate but short-lived affair. The marriage to Heidi was followed by a third and then fourth marriage in 1965, which included Winterberg’s adoption of the twenty year-old Christoph, with whom his mother was pregnant during her forced march from her home in the Sudetenland. It is presumably this connection with the Sudetenland that ultimately resulted in Hans Winterberg’s estate coming to the SMI. 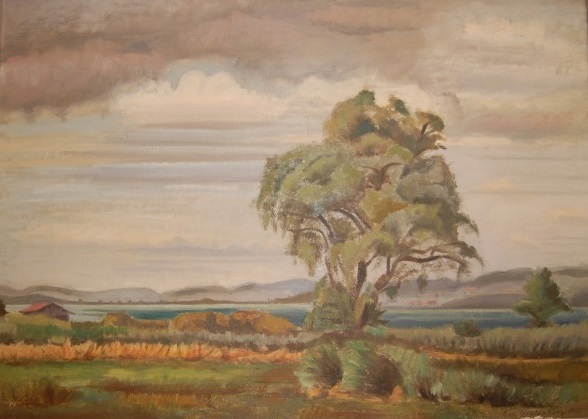 After retirement, he moved to Bad Tölz and dedicated himself to composition. His final years were spent in Upper-Bavaria, though he was buried in Bad Tölz. Obituaries mention his Talent as artist and painter; they tellingly note that he saw himself as a ‘Universalist’ rather than ‘German chauvinist’. But let’s leave these questions to one side and examine the music itself. Winterberg’s compositions represent a legacy of some twenty or so CDs in length made up of Bavarian Radio broadcasts from the 1950s to the 1980s. These appear mostly to be recordings of post-war works. Yet, his output was enormous with orchestral music alone including two symphonies, four piano concerti, three ballets, massive quantities of chamber music and works for solo piano – and that’s simply the merest sketch of an oeuvre that must compare with far better-known and more established post-war contemporaries. The musical language is officially described by Albrecht Dümling as ‘individual, with strong emphasis on the polyrhythmic, with individual rhythmic concepts synthesised into a unifying entity.’ (My translation from the Wikipedia page on Hans Winterberg) What is not clearly mentioned, but comes across as strongly as the pure exuberance and energy of his music, is the melodic and harmonic inventiveness. We are not dealing with atonality, 12-tone, or even with alienating degrees of poly-tonality. In this respect, Winterberg was not a creature of Germany’s post-war musical establishment. There is enormous atmosphere and beauty brought together in a highly expressive language that speaks boldly and openly to the listener. In short, this is music we cannot afford to ignore and nobody ever had the right to suppress. fascinating and important. but reading white on black is a burden to these old eyes. Well, I’ve changed it for you, but I’m not sure it’s any better. I wish I could find out how to get the type to go black against the white background. Much easier, thank you very much (even though my own very occasional blog is white on black as well). My type was black against white. Reblogged this on Peter Kreitmeir. Ah yes, the reading went much more deftly this time, instead of stumbling along. Thank you for the change! What an interesting story, and what a very odd contract, curiously without teeth, since the last paragraph, providing a €10,000 penalty in case of violation of contractual terms was stricken. Someone needs to record this music or make his music available. This is seriously great music. These exctracts are terribly frustrating. We need to hear the full works ! So glad you feel as I, that this is important music. The recordings all belong to the Bayrischer Rundfunk and as we’re hoping to find a label to release the BR tapes, or re-record the works digitally (preferable, though the BR performances and recordings are extremely impressive), we agreed to offer single movements of works. The piano concertos are fantastically engaging and I’ve listened to them several times since receiving the MP3s. I agree that Winterberg is an undiscovered master and we must try and do everything possible to convince the adopted son to allow access to the material and to lift the absurd restrictions. It would be lovely if more can be heard soon from this most unfortunate casualty of history, it’s amazing and disturbing that the Nazi era is still resulting in the obliteration of artists like him from history. I look Forward to Hearing it and to Meeting you! Winterberg’s music is phenomenal! What a life…what a story, and what a truly wonderful composer. Your talk at the Music + Festival 2016: Forbidden Composers: Schoenberg, Weill, Winterberg, was a pleasure, Michael! Thank you for all of your work that will continue to facilitate the recovery of Winterberg’s music. This continues to be such a fascinating story, and add one of the musicians you refer to, I can attest to the inventive creativity and quality of his music. Bravo to Peter K!